[The] board unanimously approved 15 of the 16 resolutions before them with minimal discussion. 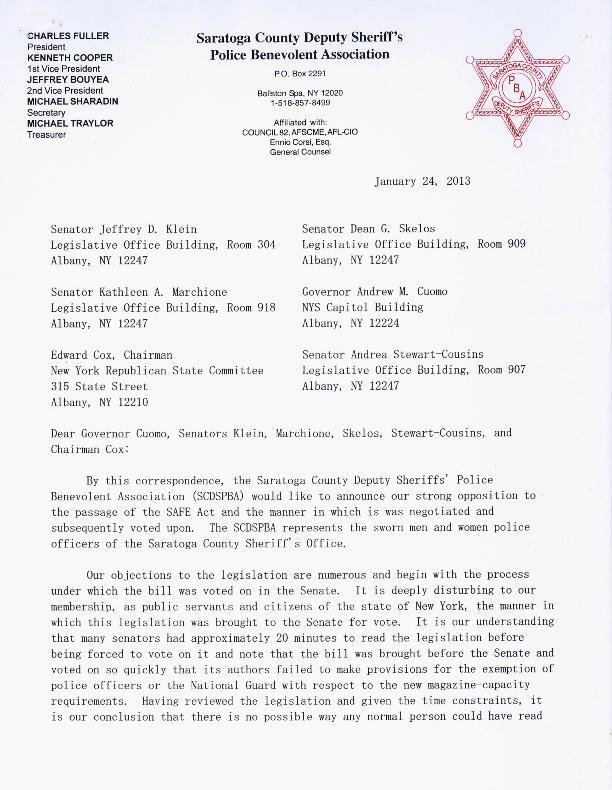 The exception to this was resolution number 31, which proposed to ‘deny the State of New York permission to use the seal of the County of Saratoga, the Saratoga County Sheriff and the Saratoga County Clerk for any purpose associated with the New York State SAFE act.’ The controversial SAFE act requires licensed gun owners to recertify all firearms within a period of five years. The resolution passed. Voting against the resolution were Supervisors Peter Martin of Saratoga Springs and supervisor Preston Jenkins of Moreau. 2nd Amendment. She has been a speaker at Gun Rights Rallies in Albany and has coordinated a petition drive calling for the repeal and replacement of the restrictive new gun control legislation. Weeks after the county Sheriffs’ PBA blasted Gov. Andrew Cuomo’s SAFE ACT legislation, Alan Grattidge, chairman of the county’s Board of Supervisors, released a statement saying it should be repealed. Grattidge and other supervisors from the county plan to go to Albany on Thursday to speak to state leaders about their concerns. It’s a pretty risky strategy opposing a governor who is notoriously sensitive about criticism and presently has the power to name the locations of where casinos would go if they are legalized by voters. Also, the county continues to operate without a county clerk, and is waiting on the governor to make an appointment.